A Life More Primitive than Exotic! 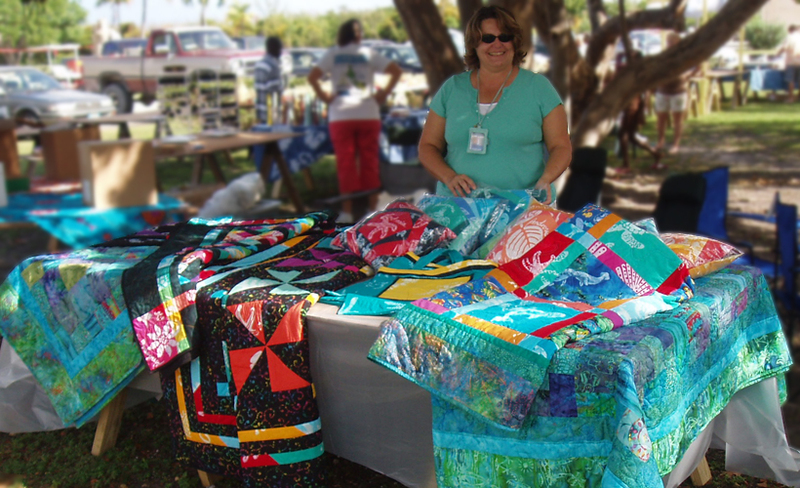 The Bahamas was my home for 15 years and where I became an avid island stash quilter. To most folks, the word ‘Island’ brings thoughts of balmy breezes in paradise and pampered vacations in quaint bungalows. While that’s often true for vacationers, that was not my situation. This was a life more primitive than exotic! My husband and I lived and worked in paradise and loved it. The down side was the lack of access. To anything! Other than a couple family operated markets, there was no shopping to speak of. The few local restaurants all served the same fare. Yes, fresh fish and conch are delicious, though a bit of variety is greatly appreciated from time to time. It was a quiet, low key lifestyle that was wonderful. Prior to our move, I had done every kind of needlework you can imagine. Finding no stitching friends on the island was disappointing. On the other hand, I met a group of women who wanted to learn to quilt. I’d grown up sewing my own clothes from the age of 12, so I knew sewing very well. Years earlier, I’d joined friends at a couple quilt classes that I really enjoyed. I went on to make a dozen or so quilts on my own before our move. 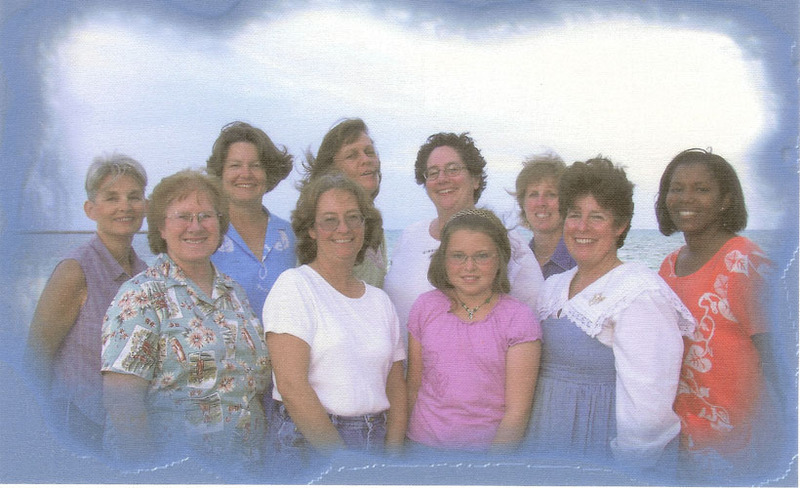 Once on the island, I met a couple other quilters and a few beginners joined us, too. So, began our quilt group and the beginning of my stash quilting adventure. The local batik factory provided the only place to buy fabric on the island. Stamped then dyed a single color on site, the island themed batik patterns were wonderful, and the colors perfectly depicted island living. They were lightweight fabrics and just right for mild climate quilts. Since I didn’t have any other fabric on hand, that was my starting point. I began with a basic rail fence pattern and then added some variations. 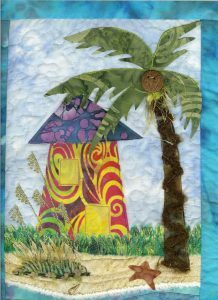 I also quilted a lot of wall hangings of beach shacks under palms. Folks loved them because, thanks to a friend with the right tools, we also made buttons from coconuts. Those buttons were sewn onto my quilted palm trees and created such a unique piece. Fortunately, there were a couple craft fairs each year which gave me an opportunity to sell quilts. I also donated quilts for local fundraisers. I made, sold, and gifted lots of quilts, probably over 100. Ordering online was still in its early stages and I was thrilled to find a new fabric source. I began collecting Bali batiks to use in future quilts. I joined a fabric club and received new fat-quarters each month. It turned into quite an extensive collection. Added to that were some larger cuts of my favorite pieces. When the time came to make a change in my quilting direction, I had all the fabric I needed to create more quilts. With my collected yards and yards of gorgeous blue and green batiks to choose from, my ‘Island Quilting’ really began. The piles of accumulated fabric became my treasure trove that set me on my path of Stash Quilting. My Stash Quilting method is simple and focuses on what’s at hand, which also makes it very economical. I may have a specific color scheme or pattern in mind, but usually I just pull from my stash pile. First my focal fabric is laid out to set the scene. Then groups of pre-cuts and fat-quarters are auditioned alongside until I find the perfect combination of what I want. The best part are the unexpected surprises that I find within my selected fabrics. Great pieces with pops of color and prints to add visual interest, and fun images to add a bit of whimsy. Finally, I pull out all my smaller scraps to fill-in any areas that needed a boost and the piecing is ready to begin. My excitement is building, and I can’t wait to start putting it all together. These batik quilts I made are what I call my ‘Island Quilts’. Each one included bright and colorful batiks with a variety of patterns. The beauty is that all the fabrics work really well together resulting in stunning quilts. 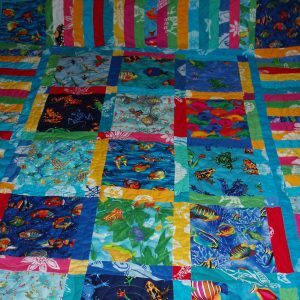 Initially, all my quilts had solid backings in nice tropical colors. Then while quilting with a friend, I loved that she used left over quilt top fabric to make the backing bigger. Now I was turning my quilt backings into a stash quilt themselves. There are always left-over fabrics when making a quilt top. That’s where our scrap piles come from. But rather than toss it all aside, I started using it for the back and mixing in some fat-quarters. Initially I was more reserved and kept the backs low-key, but then I really started having fun. Who knew I was creating backs in patterns soon to be considered modern quilts. Remember, I was living on an island and not hearing about all the new quilting going on. There is such a strong camaraderie amongst creative folks, and especially quilters. Our quilt group would get together at least once a month. Generally, we’d spend an entire Saturday quilting, teaching, learning, sharing stories and eating delicious potluck dinners. Occasionally, we’d quilt late into the night and continue the next day. We shared so many ideas and accomplished an incredible amount of quilting. As a member moved away, they’d receive a remembrance quilt made by our group. New comers were always welcome, and the learning cycle would begin for them. Living creatively is about taking advantage of the opportunities at hand. You never know where it may take you. Do you have regionally unique items you can add to your quilts? Your family and friends will love a handmade gift with a local story to personalize it. Additionally, it makes a huge difference if you’re selling in the local area. Items with a personal message or tell a meaningful story will always draw attention. What story can you tell with your quilts?